I was born in 1980, just one day before my grandmother was set to celebrate her own fifty-first birthday. Shortly before I was born, my father planted a blue spruce in the backyard. They had purchased the home new and the yard was completely bare, affording an uninterrupted view of the cornfield it abutted. That blue spruce was a steady presence in the photographs taken early in my life. In the tree’s pictorial debut, I’m snoozing in my baby carrier, Tara at my side, with the tree barely topping five feet tall. Fast-forward three years and my brother has joined us. The top of the tree is still in the frame of the photo, but just barely. On and on it grew, and on and on we grew with it. Flip through family photo albums quickly and you can watch the spruce become fuller and taller. It’s there in prom photos, on Christmas cards. It’s a quiet but hulking sentinel looking down on us. It sprouts new arms, much like our family tree with the addition of my sister-in-law, my nephews and finally my husband and our son. All the time the tree was stretching toward the sky, the people in the house were growing and changing as well. The house, which had sheltered our family for decades and whose walls had been filled with laughter, roughhousing, tears and celebration, was now quieter. I moved out for good in 2002, my brother in 2006. Like a well-worn piece of clothing that is just no longer the right fit, the house wasn’t what my parents needed anymore. In 2016, after more than 38 years on Apple Street, my parents decided to build their dream home. We cherished one last Christmas in the home. On a hushed Christmas night, my baby son in my arms, I admired the colorful lights wrapping the blue spruce. Well, they wrapped the bottom 10 feet or so, anyhow, as far as my dad could reach with his tallest ladder. The spruce, in all its glory, now stretched above roofs and utility poles. A part of our lives for so long, it was now time for the tree to watch over a new family. My parents’ new home was finished in the fall of 2017. That fall and winter, it loomed in isolation, surrounded by mud and crabgrass. In the cold Illinois winter, my parents stood at the window facing the backyard and planned the trees and plants they would add in the spring. An Autumn Blaze maple over there. A tulip poplar on the edge of the property. Hostas as far as the eye could see in the expansive built-in planters running the length of the house. 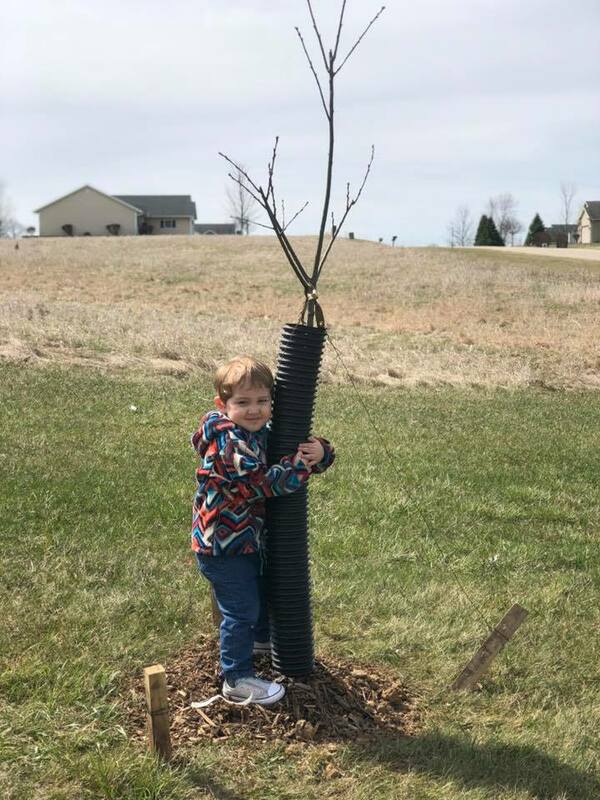 When the ground thawed, my son and I visited my parents and helped them plant the new trees they had carefully chosen at a local nursery. If you haven’t watched a toddler “help” his grandfather dig a hole in the ground, I highly recommend it. I stood there and wondered why I had spent so much money on toys when there is clearly nothing more exciting to a little boy than dirt. After the trees were planted and secured, my son walked over to an Autumn Blaze maple and gazed up at it. I immediately flashed back to the picture of myself in my baby carrier, sitting alongside the blue spruce. I ran for my camera and snapped a picture of my son wrapping his arms around the tree. Then I backed up and gazed at the tree, my eyes shaded against the sun. As I squinted, I could almost see future photographs dancing on the horizon. My son, taller and taller, but never catching up with the maple. My nephews, looking more and more like men and less like boys. My parents, arms around their children and grandchildren, marveling at the life they built together. And the tree, constant and strong, quietly watching it all.